A survivor of torture and extreme sexual abuse has fled from China to Thailand and now wants the world to know how the Chinese regime set up a special cell block in a men’s labor camp for sexually abusing female Falun Gong practitioners. She has published an account of her experience on the Falun Gong-website Minghui.org, from which this report is adapted. On Jan. 7, 2000 Ms. Yin Liping, then 32 years old, was arrested, sentenced to one year and six months in labor camp, and taken to the Tieling Forced Labor Camp. Over the next nine months she would be shuffled from Tieling, to Liaoning Forced Labor Camp, and then to Masanjia Labor Camp. Along the way she endured various tortures, sleep deprivation, and crushing loads of daily work. Her weight plummeted from 165 pounds to 135 pounds, and she began vomiting blood regularly. The door was open to Yin to gain easier treatment—give up her belief in Falun Gong, to agree to be what the authorities called being “transformed.” But she refused to do so. On April 19, 2001—at this point Yin had served over 15 months of her 18 month sentence—Yin and 9 other inmates who had refused to be transformed were called together and told they were being transferred. Yin went to one of the guards in charge of her team and quietly asked her not to mistreat the Falun Gong practitioners anymore. She looked at another guard, one her own age who had been in charge of the prisoners who tormented Yin, and Yin felt compassion for her. She hugged her and whispered in her ear that she would eventually have to pay for harming others; she should stop. The guard teared up and said to her, “Tell them you are sick. You are sick.” Yin realized later that the guards knew what was in store for them. A bus took this group of female Falun Gong practitioners to Zhangshi Men’s Labor Camp. The group was taken to a white building and their blood pressure was checked. One of them was taken away, and nine stayed. There was a guard’s office beside metal bars with a barred door. Beyond the door was a hallway with rooms leading off it. The nine were taken in and each was put in one room. Yin’s room had a queen bed and a wooden cabinet for hanging clothes. Four men were already in her room. When she walked down the hall to go to the bathroom, she saw a large room with 30 men sleeping on the floor. Yin was afraid and wondered what she was doing in this place. Then Yin Liping heard cries from the hallway from the practitioner named Zhou Guirong. “She kept calling my name,” Yin Liping said. “I tried as hard as I could to run out of the room and saw Zhou had escaped into the hallway. I held Zhou tightly and wouldn’t let go. “I heard Zhou Guirong’s terrified screams in the cells. She screamed ‘Liping.’ That should be my name. I felt like I was in a dream. But no, it was not a dream. I was sure it was not a dream. The horrified screaming dragged me back to this horrible hell on earth. “I couldn’t hear any noise suddenly and I couldn’t see anything. I struggled to stand up and sought for that familiar voice. My head was hit with a wooden clothes hanger, and I suddenly felt warm liquid running down my face. “I struggled up. I had no concept of living or dying. Nothing could stop me. I smashed against the room’s door as hard as possible while the prisoners beat my body. I kept on calling, ‘Zhou Guirong.’ And then she rushed into my room. She held me up. And then we ran to the door at the end of the hall. “We tried our best to push open the metal door. Then the metal door eventually opened. Both of us had been seriously injured. Before these police we had no fear of death anymore. We questioned them. ‘Is this China’s labor camp here? Why does China treat us like thugs? Do you have a mother, a sister, a daughter, aunties? These actions, do they represent our country? “‘If these men don’t leave our rooms, I will remember today. It is April 19, 2001, and you were on duty tonight. If we get out of here alive, we will sue you. And if we die here, our spirits will never let you live in peace. Our tolerance is not unlimited.’ The police called the male prisoners over and told them to let us sleep alone tonight. “We were taken to my room and four inmates were left to watch us. We stayed awake the whole night looking at each other with tears in our eyes. We could hear the sounds of yelling and banging on the doors from other rooms. “The next day, the prisoners who had tortured me the night before came to the room again with a video camera. This time a woman joined them. They brought a lot of Falun Gong books. They would read a paragraph and then explain it in a way that was insulting to Falun Gong. And then they would read another paragraph and give another explanation. “I said I didn’t commit any crime and this is not a place for me to study. Why do I have to be detained, to study? “The prisoners wrote down everything I said and then asked if what they wrote down was correct. And then it was time to eat. But I couldn’t eat any food there, and my body was very weak. “And then it was evening and the same thing happened as the night before. They started to torture me like the night before—the sexual abuse. The police guards had changed—they were not the ones from the night before. “Zhou Guirong was beaten and she ran to my room. I stood up and threw up blood. At that moment all the sounds stopped. And then Zhou Guirong cried and yelled my name. And then the police reported to the team leader and then they allowed Zhou Guirong to stay taking care of me. “But they didn’t forget to persecute Zhou and kept studying the teachings of Falun Gong with her in an evil way. Zhou had not seen a Falun Gong book for a long time and was going to take it, but I said, ‘We can’t study here, it is a humiliation.’ She put down the book. “When we go back home we will study the teachings of Falun Gong well,’ I said. “The devils didn’t let us stay in peace at night. And then a man said her head and body is really hot, don’t let her die. Everyone of those men came to test my temperature and were all quiet. I don’t remember how I made it through that night. 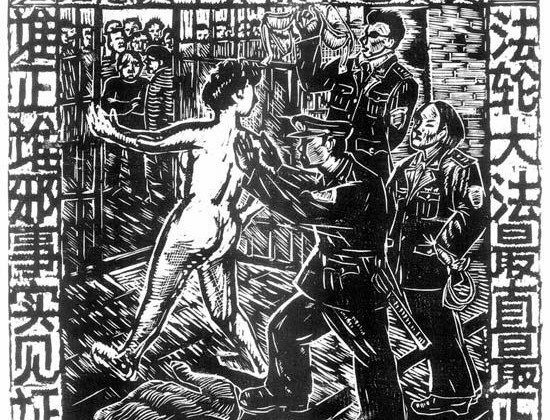 From the group of nine that were sexually assaulted in Zhangshi Men’s Labor Camp, Yin Liping knows that Zhou Guirong and Su Juzhen later died from torture. Su first had a mental breakdown. Dr. Jingduan Yang is a psychiatrist in Philadelphia who has treated survivors of torture in China’s labor camps and also interviewed several survivors of the notorious Masanjia Labor Camp. Yang said the difficulty Yin Liping had in writing down her story is common to victims of such severe abuse. “The impact on someone of this kind of abuse is horrific,” Yang said. “You can hardly measure what has been done to them. It destroys a persons’s self-esteem. It implants fear and terror inside the person physically and emotionally and cognitively. Translated by Leo Chen and Hsin-yi Lin. Written in English by Stephen Gregory. Despite some labor camps being closed, Falun Gong practitioners in China still suffer torture, sexual abuse, organ harvesting, shattered families, and shattered lives.